(Nanowerk News) A group of MIPT researchers together with their colleagues from Moscow, Nizhny Novgorod, Australia and the Netherlands have carried out the first systematic study analyzing the safety of so-called upconversion nanoparticles that may be used to treat skin cancer and other skin diseases. This study ("Cytotoxicity and non-specific cellular uptake of bare and surface-modified upconversion nanoparticles in human skin cells") is one of the most important steps on the path to new, safe and effective methods to diagnose and treat cancer. It was back in 1908 that the German naturalist and doctor Paul Ehrlich came up with the idea of a “magic bullet”– a drug that would fight only pathogenic microbes or cancer cells, without affecting the healthy cells. One century later chemists and physicians are closer than ever before to turning this idea into reality, thanks to nanotechnology. Entering the body, the nanoparticles of certain substances may accumulate in the tumor cells, “ignoring” the healthy ones. It’s possible to attach the molecules of drugs or diagnostic agents to such nanoparticles to find cancer cells and destroy them without damaging the other cells in the body. For this purpose, researchers use nanoparticles of gold and ferromagnetic materials, heating them with high frequency electric currentsso that they kill cancer cells from the inside. One of the most promising types of nanoparticles for diagnosing and treating cancer is so-called upconversion nanoparticles (UCNPs). They convert near-infrared radiation, which can penetrate deep into human tissue, in visible light, making it possible to detect cancerous cells in body tissues, change them and monitor the progress of treatment. UCNP scan be configured so that they will release drugs with the help of light. Different types of coating for upconversion nanoparticles. However, before developing therapeutic methods based on the use of nanoparticles, it must be determined whether they can cause any harm to healthy cells or not – that is the subject of the research done by Elena Petersen and Inna Trusova of MIPT and their colleagues from Moscow, Nizhny Novgorod, Australia and the Netherlands. The researchers studied the properties of one of the most common types of UCNPs, which is derived from sodium yttrium fluoride (Na[YF4]) doped with the rare-earth elements erbium and ytterbium. The group tested how these nanoparticles are absorbed by fibroblasts (the cells of human connective tissue)and keratinocytes (epidermal cells), and studied how nanoparticles affect these cells’ viability. The results show that the cytotoxicity of UCNPs depends on the cell type. They are not toxic for dermal fibroblasts and slightly toxic for keratinocytes. However, the toxicity for keratinocytes depends on the concentration of the nanoparticles, meaning that these cells can be used as a biological indicator for evaluating the safety of different types of UCNPs. 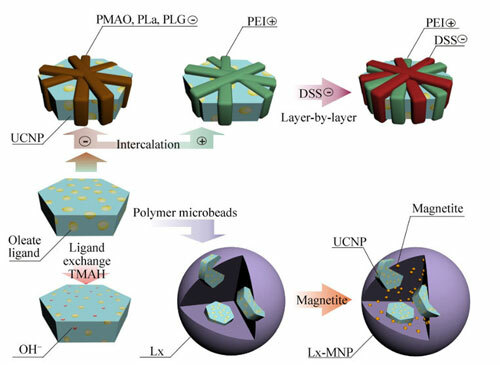 In addition to the “naked” nanoparticles, there searchers tested several modifications of polymer-coated nanoparticles. In these cases, the difference between the response of fibroblasts and keratinocytes was even higher, for example, the particles coated with polyethylenimine interfered with the intracellular metabolism of the keratinocytes, but had no effect on the fibroblasts. The group identified the types of polymer coating that made the nanoparticles as safe as possible. “This study is an important step towards beginning to use UCNPs to diagnose and treat skin cancer and other skin diseases,” says Petersen. According to her, there are already studies of the use of nanoparticles for the treatment of skin diseases, but to utilize them on a large scale it is necessary to prove that they are safe and efficient.